Huge Microsoft price drop alert! 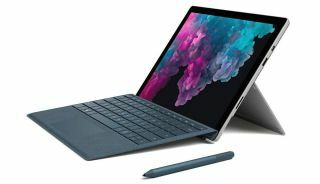 There are certain Black Friday deals you expect to see every year, and others you think you won't see in a million years - an almost £400 price drop on a new Microsoft Surface Pro 6 being one of them. Yes, you read that right. As of this minute, you can get hold of a brand new Surface Pro 6 12.3" two-in-one laptop with platinum keyboard cover 2018 for just £749 - that's £380 off the retail price! So what do you get for your money? All the performance of a powerful laptop with the versatility of a tablet, that's what. This spec Surface Pro 6 boasts an impressive 13.5 hours of battery life, houses a 128GB solid state drive, 8th generation Intel Core i5 processor and 8GB RAM and, if that wasn't enough, a stylish platinum keyboard cover is thrown in for the price too. Being one of the best tablets currently on the market, we don't expect this deal to hang around for long, so if you're in the market for one, now's the time to buy.